Above: Fireman Billy Bell (left) and his driver sign on at Grantham Loco for Royal Train duty. Photograph lent by Joe Bell. 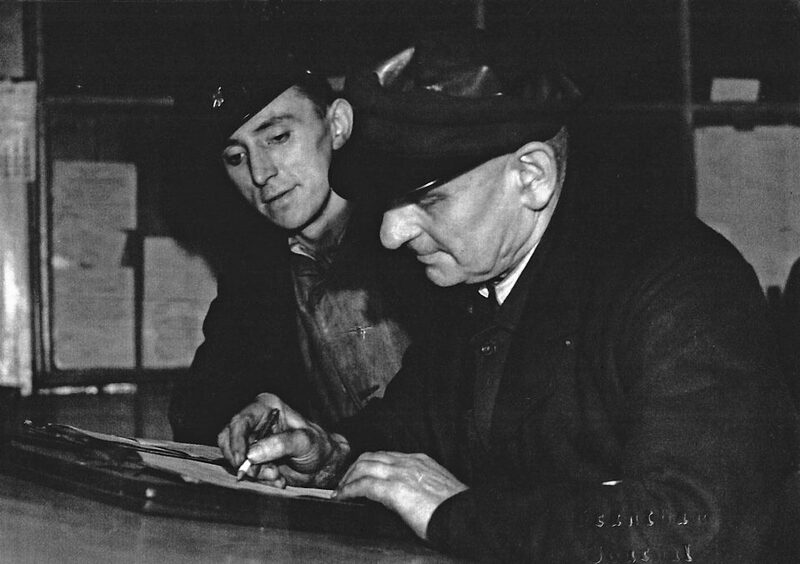 Here is a photo of Dad signing on for the Royal Train with his regular driver who I'm fairly sure is Harry Royce who lived on Launder Terrace, just down from us in Queen Street . The normal practice with the Royal Train, on its way down from Balmoral to London (that's 'Up' to us on the railway), was to come off the main line at Barkston and stick it up a redundant stretch of the Lincoln line overnight. Next morning, a Grantham crew would go out and take it to King's Cross. It suited the system to have a crew that lived near to each other. In those days at Grantham shed, along with Top Shed at London King's Cross, the Top Link crews were paired with their own locos, and I can remember them having a small brass plate with their names on which they fixed on the cab side. I've never seen one of these in all the thousands of photos I've studied over the years, but in the day I saw one in the flesh . I remember going round the 'angle (Grantham shed's locomotive turning triangle) with them on 60148 ABOYEUR, which was probably their engine. Class A1 No. 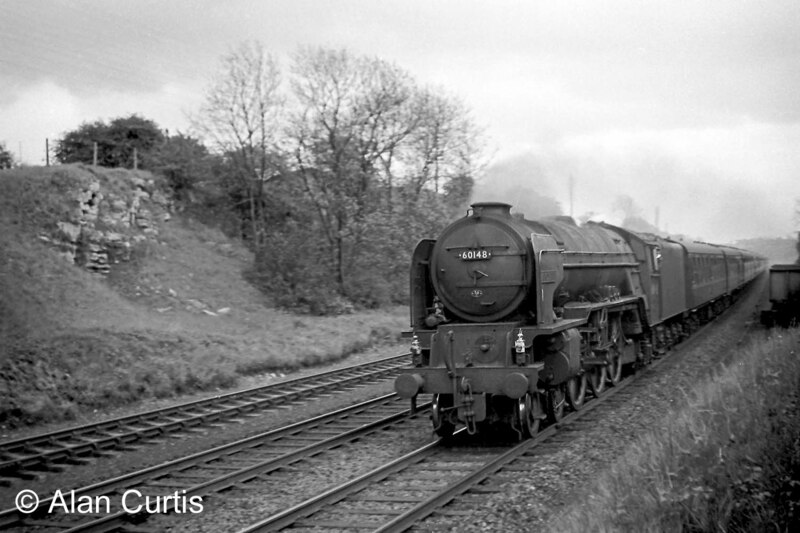 60148 'Aboyeur' heads a Down express between Highdyke and Great Ponton on Saturday 18th May 1963. Photograph taken by Alan Curtis. I also have a photo somewhere of Dad and his fireman with 60114 W.P. ALLEN on a running in turn with a pick up freight. The second time Dad had the Royal Train, a blue and yellow Class 47 diesel, we lived on the Flat Tops, so it followed to pair up Dad with Hodge Collingwood - though that's another story. Ted Hailstone was the King's X inspector in charge and Hodge nearly gave him a heart attack, but you need to get the story from Hodge himself! 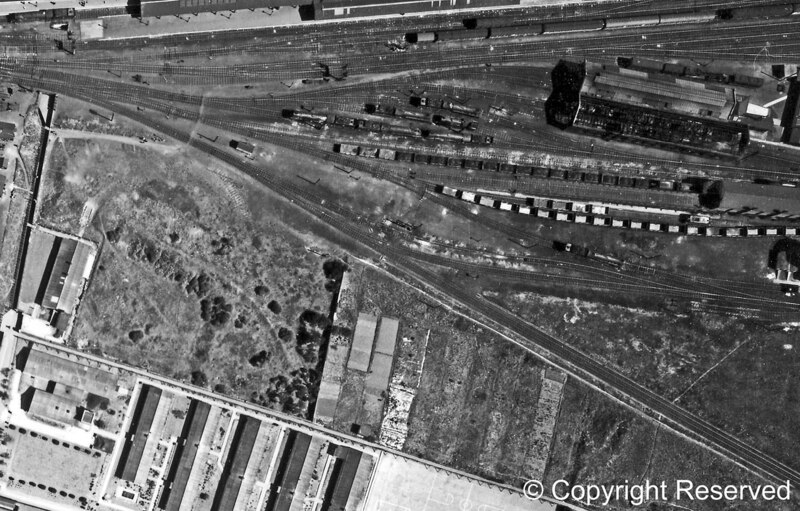 If you look at the aerial photo of the allotments before the 'angle was built you can see the large turntable by the wall at the north end of the allotments. Our allotment was three or four up from the wall and that's all that survived after the 'angle was put in. You can imagine what a place the bottom of that allotment was to a kid mad on locos. First a turntable and then the 'angle. Heaven. 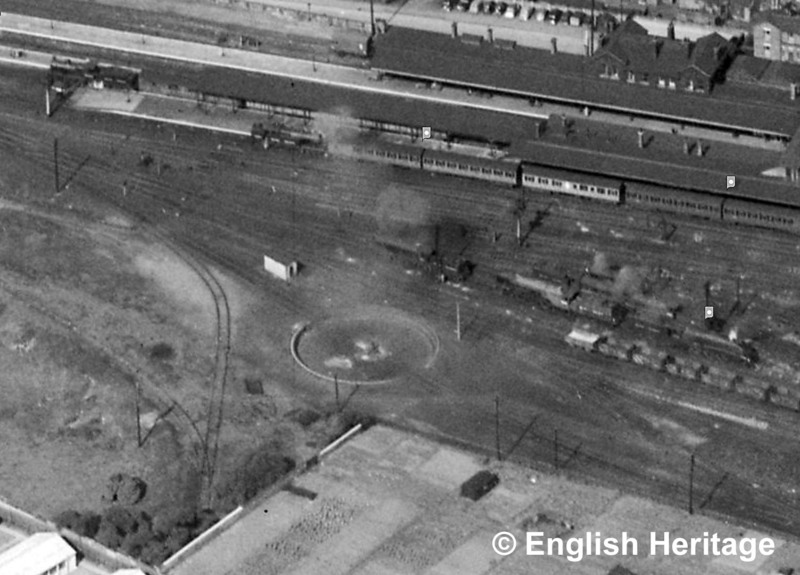 This aerial photograph was taken on 19th April 1950, and shows the site of the 70-foot turntable. The well-kept allotments at the bottom of the photograph would soon be cut back in length from the station side for the laying of part of the turning triangle. The Bell family's allotment is one of those seen just below the centre of this aerial photograph, which was taken after the turning triangle was constructed. The land off to the bottom right, as far as Springfield Road, had also been railway-owned allotment ground until it was needed for the triangle. Over the boundary wall is the Loco Yard, with lines of engines prepared for their next turns of duty out on the main line. Beyond them is the Western Platform of Grantham station. I suppose being, as they say, "of an age", I'm lucky enough to have been around when we had all the King's Cross A4s while Top Shed was being rebuilt after the war. Sadly they were black and filthy, with only 'NE' on the tenders, but what memories.